But if we live as if it doesn’t matter, and it matters, then it matters. African Love Grass (Eragrostis curvula, hereafter referred to as ALG) has become very widely naturalised in temperate climates in Australia. It is a serious problem in many areas of the Southern Tablelands and the ACT. A form of ALG has become a serious pest in the Murrumbidgee River Corridor (MRC). There is a requirement to manage the ALG that occurs within the corridor to minimise its further spread to retain and enhance the natural, social and economic values of the MRC. The management of such a vigorous and well adapted weed species in much of the terrain associated with the MRC is extremely difficult. Certain herbicides have proved efficient but some have limitations on where, how and when they can be used and in one case the longer term supply of the favoured herbicide (Frenock®) is uncertain. This poses a potentially severe constraint on management actions away from areas of porous soils or watercourses. Grazing has been clearly shown to be a useful management tool for ALG. On due consideration of all the issues involved with management of this priority ACT weed, and in particular the wider environmental and agricultural implications if it continues to spread, this strategy concludes that grazing management will be an important management action into the future. The strategy also recognises that there are disparate views on the use of herbicides and the use of the MRC for agricultural pursuits. The strategy recognises this factor and proposes that one of the primary actions be to convene a suitable workshop/information forum for all stakeholder groups as an integral part of the strategy. RECOMMENDATION 1: that a workshop/information forum be organised for all stakeholder groups to discuss management proposals for ALG within the Study area of the MRC. RECOMMENDATION 2: that the effectiveness of the use of heavy rotational grazing in the management of ALG be a primary discussion point as part of the workshop to be conducted for stakeholder groups. RECOMMENDATION 3: that land managers monitor the incidence of new infestations of ALG after moving stock under any rotational grazing program. RECOMMENDATION 4: that the potential of using PMA’s to clearly detail rotational grazing regimes within the MRC be examined. RECOMMENDATION 5: that the current level of extensions work provided by Environment ACT be continued due to the positive attitudes established between the agency and rural lessees. iii)preparing a report on agreements to be presented to the ACT government. RECOMMENDATION 7: that raising awareness of ALG be taken into the community as outlined in Recommendation 10. RECOMMENDATION 8: that when an agreed position on the management of ALG is reached, there be a concerted effort to relay the agreement to all members of the ACT Legislative Assembly, preferably by combined representations of stakeholder groups. RECOMMENDATION 9: : that further trials and demonstrations be established to assess best practice and recommendations for ALG control on arable soils on rural leases. iii)the agency take a lead role in keeping information channels between stakeholder groups operating. RECOMMENDATION 11: that further trials on the effects of available chemicals in native grasslands be conducted. RECOMMENDATION 12: that a program to increase the skills of interested community groups to recognise ALG be prepared and presented, preferably as part of any proposal to map the locations of ALG in the ACT (see Recommendation 17). RECOMMENDATION 13: that a heavy and consistent management effort should be applied to all roadsides that penetrate the corridor, applying all feasible methods to prevent further spread, but taking special care where native remnant vegetation still occurs. RECOMMENDATION 15: that the workshop/information forum work towards a co-ordinated and strategic approach to management of ALG within higher value conservation zones of the MRC. RECOMMENDATION 16: that elimination of higher elevation occurrences of ALG within sub catchments be a focus of attention by all land managers. a)that a Territory wide survey for ALG infestations is warranted, and an effective means of achieving this would be by encouraging community groups to become involved. Mapping should be a priority item for discussion at the workshop/information forum proposed in Recommendation 1.
b)that the wider infestations of ALG on the periphery of the corridor be accurately mapped by rural lessees with their immediate neighbours where this information is not currently available, or priority management actions are required. RECOMMENDATION 18: that the continuation or re-introduction of grazing on sections of the river bank as specified on the accompanying map be a priority for discussion between stakeholder groups at the proposed workshop/information forum. RECOMMENDATION 19: that the potential of funding ALG management programs through the various funding sources, especially the Rural Conservation Trust as recommended under the recent Purdon review on PMA’s, be investigated. The production of any weed management strategy relies heavily on current knowledge and experiences. This strategy is no different. The author approached various rural lessees, ACT Parks & Conservation Service staff and individuals connected with community conservation organisations during the early stages of this strategy, and acknowledges their contributions and/or comments. Particular note is drawn to the contributions of the late David Busby of the ACT Parks & Conservation Service whose commitment to conservation, Landcare and viable agriculture in the ACT and nearby region is known to many of the stakeholders in this strategy. Vale, David – your many contributions to a sustainable society will always be appreciated, especially by the author and your many rural and city friends. Also acknowledged are: Tony Brownlie, Dave Boorman, Jules Bros, Matt Flint, A Geikie, Peter Gullet, Leon Horsnell, Clive Hurlstone, Val Jeffries, Bruce Lindenmayer, Terry Michell, Darren Rosso, & Bill Schuller. This management strategy has been prepared by Geoff Butler & Associates for the Parks & Conservation Service of Environment ACT and the rural lessees of the Lanyon Bowl Landcare Group. Given past controversy in regard to various aspects of management in the Murrumbidgee River Corridor, this strategy has been written (in part) to explain the nature of the particular problem of ALG and some of the potential management techniques. It also proposes some other tasks within the study area. The strategy was prepared in this way to provide some background and explanatory notes so all stakeholders can, if necessary, discuss the issues with some degree of understanding of what is required if we are to manage ALG within this portion of the MRC. The field work confirmed the widely accepted opinion that ALG will be a permanent future component of the flora found in the corridor. The strategy has been prepared with this in mind. It was also found that the primary technique already used to manage ALG over extensive portions of the Corridor and nearby lands (i.e. grazing) is well established and works. The collective knowledge of agency (agricultural and conservation) staff and rural lessees of grazing management is sound and solidly based on experience. The work of Stuart Burge, former Agronomist with the NSW Dept. of Agriculture and now private consultant, combined with the previous experience of rural lessees in the district has shown that ALG can be utilised by stock and grazing is therefore a primary consideration of this strategy. While grazing is an activity that may contribute to land degradation when not managed properly, it is also one that has potential, when integrated with other techniques, to be a useful management tool for grassy weed species. The proposed use of grazing will have to be highly focused and managed to avoid adding to existing degradation problems in the MRC. The strategy has drawn scattered information together and makes some specific recommendations for the study area. The strategy has taken into consideration the management issues outlined in the MRC Management Plan (EACT 1998), especially in relation to the management philosophy and community values and assets within the MRC. The objectives of the strategy also conform to several of the targets and actions for grazing management, chemical management, soil erosion, weed management, native vegetation decline and native remnant vegetation protection within the Murrumbidgee Catchment Action Plan, or MCAP (MCMC 1998). ALG has widely naturalised within temperate climatic zones in Australia. It is a serious problem in many areas of the Southern Tablelands and the ACT. A form of ALG is a serious pest in the Murrumbidgee River Corridor. There is a requirement to manage ALG that occurs within the corridor to prevent its further spread and assist in retaining the natural, social and economic values of the MRC. The brief required an examination of and recommending measures for managing varying degrees of infestation of ALG in a selected portion of the MRC. The area for the study was defined as the MRC from the Old Tharwa Sandwash to Pine Island, a distance of approximately 18km. Special attention was to be paid to the management of ALG within the more “natural” precincts of the study area. identify priority areas for control. ensure bank stability was not compromised. ensure that funds and chemicals were not wasted. map the location of Lovegrass and other weeds and native vegetation. identify changes to land management practices where required. Section 2 - Stakeholders & Consultation. The stakeholders in regard to this strategy are the whole community of the ACT. While this may be an obvious conclusion to some due to the social, financial and environmental implications of ALG, it is highly unlikely to generate any form of “whole-of-community” interest. The main interest in any proposals to manage ALG within the MRC are more likely to come from the immediate stakeholder groups, these being the Parks & Conservation Service (P&C), rural lessees and environmental groups. For this reason opportunities were given to various groups and individuals to contribute their views on the management of ALG within the MRC. Initial consultation was undertaken with staff of the P&C Service from the Community Support Unit and the MRC Unit and a number of rural lessees associated with the Lanyon Bowl Landcare Group. The author also attended 2 information forums for rural lessees (one by Stuart Burge, an agricultural consultant, and one by the late David Busby, an agricultural extensions officer with the P&C Service) and attended two site visits with P&C staff to areas of infestation that had been subject to management actions for ALG. A separate meeting was held with the staff of the MRC Unit. ALG has been described as a “perplexing” pasture species as it is regarded by authorities in some areas of Australia as useful for animal production and soil stabilisation but in other areas as a serious weed (Campbell et. al. 1987). ALG has also been recognised as a serious weed by environmentalists, despite the lack of references to ALG’s consequences on the natural environment within all the literature examined. Some publications, mainly those dealing with agricultural production, refer to the environmental value of ALG as being “a useful species that stops erosion in corridors, riverbanks or wasteland where it is no problem” (Johnston - no date). It is agreed that ALG does prevent erosion, but ecologically it has the potential to be a major problem. ALG is said to prefer disturbed areas (Johnston – no date; Campbell et.al. 1987)), and is an aggressive and highly invasive species with the potential to infest productive farmland where stock disturbance and grazing patterns can permit its entry. It has also been highly invasive of stable vegetation in areas reserved for environmental conservation (Campbell et.al. 1987). As a result of its effects on both agricultural sustainability and natural environments ALG appears to be generally accepted as an undesirable species by all stakeholders in the MRC. There is considerable variation within the varieties of ALG. Four (4) varieties of ALG have successfully naturalised in Australia. The main naturalised varieties in Australia are the “short chloromelas”, which are a low growing, vigorous, tufted perennial form, usually to ca. 30cm tall with a blue-green appearance. The leaf apices are usually dead and curled. ALG forms dense swards of tussocks, often to the exclusion of all other species. The growth rate is, however, very much temperature dependant. ALG is able to survive drought, low nutrient regimes and grows extremely well under a wide range of climatic conditions. It is a recognised pioneer plant species (Campbell et.al. 1987) which is one of the reasons that it has been used so widely for soil stabilisation work. It is the short chloromela variety that has naturalised through many areas of the Southern Tablelands and Monaro districts of NSW, and is a variety that has naturalised widely in the ACT (Unknown – no date). This variety is able to be utilised at particular times of year for stock production (D. Busby and A. Geikie pers. comm.). ALG infestations establish by seed that is dispersed by wind, water, stock movement, rural and horticultural machinery, road maintenance activities and machinery, general vehicle movement, fodder, transport of infested soil and pedestrian traffic. Infestations within the ACT have occurred as a result of all these factors. what environmental conditions it is growing under. where the ALG is growing (the location and landuse of the area concerned). which of the 7 varieties of ALG in Australia is present, as some varieties are more palatable than others. low palatability, leading to preferential overgrazing of desirable species and thus contributing to continued invasion by ALG. low digestibility, leading to lower levels of animal production. low crude protein levels, especially in cooler months when higher protein levels are needed. low tolerance to frost, reducing the availability of fresh pick. abundant seeding which results in the capacity to form very dense swards, leading to the invasion of pasturelands and “natural” environments to the exclusion of indigenous species. seedlings which establish readily on disturbed and relatively undisturbed sites and outcompete more desirable species. seed which is readily translocated by a variety of vectors and activities, and which can spread extensively and rapidly after disturbance, natural drought events and during floods. vigorous growth rates over the warmer months, leading to further displacement of desirable native and introduced pasture species. bank stabilization (even though native vegetation had performed this function for eons0. before European settlement). as a “holding” species which is able to be utilised if other feed is in short supply. potentially some protection for some species of native wildlife from predators. ALG has been declared noxious in most local government areas in NSW as a W3 weed i.e. the weed must be prevented from spreading and its numbers and distribution reduced. Considerable efforts are underway on the nearby Monaro Region to curtail the spread of ALG. The Monaro was the most likely source of infestations of ALG throughout many areas of the ACT. “A serious weed that poses a threat to agriculture, the environment and the community having the potential to spread to other areas. New or isolated infestations must be fully and continuously suppressed by all land managers. Existing infestations must be continuously suppressed to significantly reduce infestation and prevent further spread”. The Category 2 classification clearly indicates the community and land managers concerns with regard to the management of ALG in the ACT. It also clearly reflects the inherent dangers of permitting ALG to spread unchecked. The current infestations of ALG in the ACT are widespread and vary from single tussocks to extremely dense infestations with 100% ground coverage. ALG is said to occur predominantly in lighter (sandy) granitic origin soils. This is the case within the MRC. However, plants are being found on an ever increasing basis in urban areas and more widely throughout the region on a variety of soil types. It is commonly found along roadways, creeks and rivers on both agricultural and conservation lands, and in both disturbed and undisturbed sites. Large infestations occur on the Monaro Hwy where it leaves the urban area towards Cooma, probably due to seed originating from vehicles transporting topsoil into Canberra for use in the horticultural industry. Contaminated soil is almost assuredly the reason for many of the outbreaks in the urban areas where both Chilean Needle Grass (S. Sharp pers. comm.) and ALG have been recorded as emerging in new lawns where topsoil has been used. The most publicised infestation is that within the MRC. This infestation appears to have been noted only some 20 years ago when the “unusual grass was noted along the river” (V. Jeffries pers. comm.). It is highly probable that the first infestations arose as seed which was transported down the Murrumbidgee River from extensive riverine infestations on the Monaro. ALG continued its spread unabated for some considerable time, and has reached a stage where elimination is unachievable. AGL will always be present in the MRC, but there are opportunities to manage the species, thus minimising the potential for further escape. There is no possible way currently to stop its spread along the river. It should be noted that in 1997/98 the known cost of management of ALG in financial terms in the ACT was $55, 540. This takes no account of the private costs of management incurred by individual rural lessees and many Landcare/Parkcare groups. It takes no account of the loss in terms of rural production. It also takes no account of the environmental effects the species has on “natural” values within the corridor, which are considerable. The MRC is part of the National Capital Open Space System (NCOSS) and contributes to the landscape, ecological, scenic, cultural and recreational resources of the ACT (EACT 1998). The MRC extends for some 66 km through the ACT, forming a corridor of land and water up to 4 km wide (EACT 1998). The portion of corridor dealt with in this strategy is from the location where the Tharwa Sandwash used to operate to Pine Island, a major community recreation area. The land uses within this portion of the corridor include rural production, various community facilities and nature reserves (EACT 1998). Past usage of the corridor, particularly for rural activities over some 150 years, has resulted in this portion of corridor being degraded from its natural condition for much of its length. As Canberra has grown, suburban areas have moved closer to the river and as a consequence further pressures are being placed on the corridor, particularly with regard to sediment and nutrient discharges through stormwater, and additional pressures for recreational usage. An important function of the NCOSS, and therefore the MRC, is to demonstrate how ecologically sustainable development principles can be adopted to allow nature conservation to be integrated into the ACT’s community life patterns and economy. The management philosophy for the corridor strives to retain the areas generally natural and undeveloped character to ensure it remains a distinctive resource for the community (EACT 1998). The Murrumbidgee River Corridor Management Plan clearly indicates that leasehold management is an important component of overall management, and that rural lessees will continue to play and important role in management of parts of the corridor (EACT 1998). The field assessment for this strategy showed clearly that with regard to weed management generally, and more specifically the management of ALG, the role of the rural lessees is not just important, but absolutely critical to the successful implementation of the actions of this strategy. a number of rural grazing/agricultural leases. The rural leases concerned are South Lanyon, Spring Station, Lanyon, Spring Station Creek, Castle Hill, Lambrigg, Tharwa Hill and Upper Freshford. The MRC has been highly disturbed for much of its length through the ACT, and this is the situation with the length of corridor dealt with in this strategy. Remnant indigenous vegetation remains along some small sections of the corridor (see vegetation map – attached Map 2), with some areas of higher conservation quality than others. The terrain along this section of the corridor is readily accessible and does not contain the less accessible gorge country of nearby sections of the MRC e.g. Gigerline Gorge, Red Rocks Gorge. This accessibility has resulted in heavy usage of this section of the river for recreational and rural pursuits since early European settlement. A major factor in the degradation of the corridor has been the introduction of a suite of invasive plant species, amongst these being ALG. The management of ALG within the MRC has to take into consideration effects on known social and economic values, but also natural values. Of special concern are the effects of ALG management practices on riverbank erosion, water quality issues and conserving other natural assets. Section 5 - Overview of indigenous vegetation. As indicated earlier in this strategy, the MRC has been intensively utilised for rural production since the earliest days of European settlement. The past landuses have resulted in the landscape being highly modified. What vegetation was not removed has continued to decline, especially as mature remnant trees age and die. Grazing has effectively prevented regeneration from occurring. As a result of this decline, policies to redress the balance have been proposed for many years (NCDC 1983). The river corridor was almost certainly originally clothed in dense indigenous riverine vegetation at the time of settlement, the remnants of which are still obvious today on some sections of the study area (e.g. both sides of the river between Point Hut and Pine Island, Tharwa Sandwash). River She-oak (Casuarina cunninghamiana) was almost certainly a dominant species within the study area, with remnant stands still existing. This durable timber from this tree was sought for timber products, e.g. making roof shingles, casks, tool handles, bullock yokes, and light construction work. Other timber such as Manna or Ribbon Gum (Eucalyptus viminalis) and Black Cypress Pine (Callitris endlicheri) were also utilised for construction work and fuel. The other flora species, consisting mainly of shrubs and small trees, were probably utilised only rarely if ever and gradually diminished in extent through clearing and grazing activities, and the gradual establishment of highly invasive woody weed species such as Willows (Salix spp), as well as a number of other species of horticultural origin whose invasion of the MRC continues today. Programs of removal have commenced on species of priority concern (various willows and English Elm). The remnants of the original riverine vegetation community that still exist along the river are environmentally important and these zones of conservation importance are indicated on the vegetation map. The dominant tree species were most probably Manna Gum (Eucalyptus viminalis), Black Cypress Pine (Callitris endlicheri), River she-oak (Casuarina cunninghamiana), Silver Wattle (Acacia dealbata), Red-stem Wattle (Acacia rubida) and Kurrajong (Brachychiton populneus). The primary shrub species were River Bottlebrush (Callistemon sieberi), Burgan (Kunzea ericoides), Juniper Grevillea (Grevillea juniperina), and Woolly Grevillea (Grevillea lanigera). The understorey would have consisted of extensive areas of River Tussock (Poa labillardieri), especially over flood plains. It was noted that a current threat to River She-oak may be Mistletoe (Amyema cambagei) infestation, which has also been noted in very heavy infestations on this species on the Lower Molonglo. Mature (but not old) trees have been killed by the infestations in both locations. Mature Manna Gum (Eucalyptus viminalis) are also dying and not being replaced due to grazing pressure. The remnant riverine vegetation is degraded but offers a solid base for rehabilitation. It is therefore of some priority that existing areas of remnants be conserved and built on by intensive planting and regeneration, both of which will assist in the management of ALG in these locations. Rehabilitation of these areas will also provide “islands” of native vegetation which will contribute to wildlife movement within the MRC. It was noted during field work that stock has great difficulty in accessing the river through the dense stands of riverine shrub vegetation. Where stock access is not desired, this may be a means of providing set access or stock watering points while helping to reduce ALG populations. As with any weed management project, there are a number of constraints that need to be taken into consideration when preparing a management strategy. The following items are the primary constraints that in some way may impinge on or otherwise affect the management of ALG in the MRC, together with comments on the constraints with relevance to the study area. Effective weed management is totally dependent on the general acceptance that any particular plant species is a problem. In some cases weed species may have detrimental effects on a particular land type or landuse, well recognised by the community sector involved with the land type or landuse, but not accepted or not even considered by other community sectors or interest groups. This is not so with ALG. The ACT government agencies dealing with agricultural and conservation matters, rural lessees and environmental groups all recognise and agree that ALG has severe detrimental effects on the social, economic and environmental welfare of the local region. The first thing for a successful AGL management program is for all interested parties to accept that ALG will always be present in the MRC. This is in part because of major upstream infestations that will be a continuing source of re-invasion. However, if ALG infestations that currently exist in the ACT remain untreated, the infestations will expand considerably in ever decreasing periods of time. This will have major environmental and economic effects in particular. This daunting prospect can tend to create negative attitudes, with a propensity for promoting anger and seeking someone to blame. However, it has been shown by practical experience in the ACT that ALG can be managed, with definite improvements for the natural environment and for rural production. A considerable amount of experimental trial work has resulted in the implementation of a number of environmental improvements in management techniques (e.g. focussed grazing and reductions in the amount of chemical required to be applied to kill the species). While it must be acknowledged there is a major battle ahead, there appears to be a positive approach at present with regard to having to “live with Lovegrass”. It is hoped that this positive approach will motivate all stakeholders to understand the complex issues involved with the management of ALG. This will assist in implementing management actions without unreasonable delay. It is envisaged that the workshop participants will, after examining this report, work co-operatively to develop an action plan which will identify any priorities (especially from the recommendations contained within this report), the various resources required for the project, the responsibilities of the stakeholder groups and a time-line for implementation. AGL is considerably widespread in the ACT and region. It has proved to be a highly mobile species, especially near watercourses and transport routes. One notable problem is the extent of the infestations in and around the urban region. While these populations remain they will be transported by vehicles and the problem will worsen. Another consideration is the importation of infected soil from nearby NSW. This practice will continue to ensure new infestations at wide and varied distances throughout the region. The vigorous growth of ALG enables easy establishment, even in undisturbed native vegetation. Concurrently with efforts to contain AGL in the MRC, there must be similar management efforts made throughout the ACT. ALG has always been targeted in certain parts of the ACT. More recently, ALG has been listed as a priority species for management (ACT Weeds Working Group 1996), which indicates the serious effects of this species within the ACT. There are a number of environmental considerations with the management of ALG:. i)Habitat: With its widespread nature, tussocky growth, density of infestation and unpalatability, ALG may offer some protective cover for reptiles, small mammals and invertebrates in otherwise disturbed environments. However, this possible advantage is certainly outweighed by its ability to spread into undisturbed native vegetation, especially grasslands and woodlands. The ability to provide potential habitat would only be a constraint in very unusual circumstances. An immediate problem is the spread of ALG into a number of zones of high conservation quality native grasslands and riverine flora within the MRC. If ALG continues its spread into these areas and is not soon checked, these areas of conservation value will be lost. It is therefore considered that even though ALG may provide some protective cover, its ability to spread and exclude native flora outweighs any habitat advantages. ii)Herbicides: The use of any chemicals within natural areas or grazing areas is undesirable. Frenock® is currently used off-river, but it cannot (and should not) be used within the porous sandy river alluvials bordering the river, due to possible leaching and the obvious effects on water quality and habitat. Glyphosate has proved useful at particular times of the year, and a formulation is available (Biactive®) which is registered for use near water, but extreme care should still be taken to avoid direct application to water. Some methods of application (e.g. boom spray) of herbicide should be avoided where it will destroy plants on ALG free areas.. For areas where ALG can currently be managed with Frenock®, the present uncertainty about future supplies of the chemical may become a management constraint. iii)Soil stabilization: Wholesale removal of ALG in some sections of the MRC could induce large sections of bank collapse, causing the loss of productive land and natural habitats, loss of water quality, further sedimentation and turbidity and higher nutrient load than currently exists. The management solutions consider bank stability as a high priority, placing limitations on the amount of vegetation removal acceptable. There are a number of steep banks within the study area that are currently grazed, and which are deteriorating. These sites are mostly in direct line of high level flows, and need protection from further erosion. They are suitable sites to establish riverine vegetation and to assist in increasing the wildlife habitat values of the MRC. iv)Off river watering: Considerable portions of the study area are currently grazed. Some of these need to be withdrawn from grazing or at least monitored for degradation on a regular basis. Grazing would be beneficial in other areas. If bank stability is compromised by grazing on any stretch of bank at any time in the future, stock should be withdrawn until a resolution is found and agreed to by the land managers involved. Because of this, off-river watering points may be required in some locations. While overgrazing is a very real issue in the eyes of the public, heavy rotational grazing is already used and accepted as a useful technique for managing ALG. Evidence is available within many areas of the MRC of its effectiveness. Even in those areas subjected to grazing, but not deliberate heavy grazing, the incidence of ALG is lower. 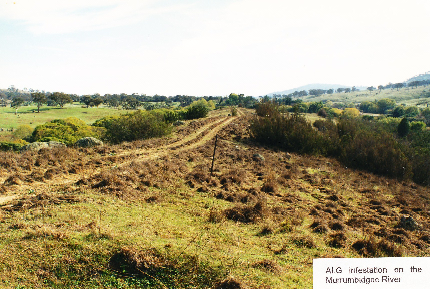 As heavy rotational grazing is a serious option for management of ALG in some sections of the MRC, there is the potential for a negative public reaction to its use (ACT Landcare Subcommittee 1997). Some attention should be given to an awareness raising exercise for the public about this technique. Grazing also has the potential to spread seed of ALG through faeces, with the viability of seed of similar perennial grass weeds (e.g. Serrated Tussock) within the digestive tract of sheep believed to last for 14 days. This factor must be taken into account when moving stock to other locations after any heavy rotational grazing when seed of ALG is viable. After grazing of ALG infestations is completed under any rotational program, grazing stock should be “rested” for 14 days on improved pasture areas which will assist in preventing the germination and establishment of ALG seedlings. The current review of Property Management Agreements (PMA’s) could be instrumental in formulating the broad framework for co-operative arrangements for long term management by grazing within the MRC. The specific grazing regimes that are implemented can come about as the result of agreement between the respective stakeholders. The objective of longer term lease arrangements may also minimise another constraint for rural lessees, and contribute to their visions for (and care of) their properties, thus minimising what is said to be an existing constraint on them. The use of PMA’s or a similar formal agreement to clearly define grazing parameters may well assist a better acceptance of continued grazing within the MRC by some stakeholder groups. It is quite apparent that good relations exist between current extensions officers within the Parks & Conservation Service and the rural lessees within the study area. These groups have worked closely together to better understand and utilise the most effective and efficient techniques for the management of ALG. Experimental programs initiated by these groups have shown that infestations of ALG are able to be managed. It is of crucial importance that the current level of extensions work by the P&C Service be maintained. Any deterioration of these services will almost assuredly lead to less effective management of ALG. There are substantial direct and hidden costs, both in human resources and materials, in any effective integrated weed management program. The economics of weed management programs, because of their often long term nature, are prominent targets for reducing financial inputs when finances alone are considered. What needs to be continually taken into account is the cost benefits of effective management, and the certain future financial, social and environmental costs and consequences if serious invasive weed species are not effectively managed in the long term. At present, rural lessees are “doing the hard yards” financially. While ever the current financial regimes (allied with competition policies and so-called “level playing fields”) continue to demand higher quality and quantity of production for ever decreasing prices, care and management of the land will suffer. These issues are working in complete opposition to community expectations of land management, and fly in the face of the overall philosophy of Landcare and all “best practice” land management on the Australian continent, given the fragility of the land. If continued, this form of financial management will lead to a lack of motivation for, or less priority on, land management which will lead to unbearable financial costs to the community as a whole in the future. Until the true costs of rural production are recognised, and the farmer receives the right price for produce at the farm gate, this will continue. However, this is the system at present and is the one under which we have to attempt to resolve weed management programs. While farm finances due to the above are difficult in many instances, there may be other factors that may have some bearing on availability of finance for management purposes. For example, is the size of holdings viable for the type of production undertaken? Are there other constrictions required under law, the costs of which are an imposition financially? In some instances, second incomes are required which involve time away from managing the land. Are the demands placed on rural lessees as a result of community expectations too great? There is no doubt that the ALG problem has potential repercussions for the whole community. There is also no doubt that the community has the potential to financially assist in the resolution of the problem. Therefore it is crucial that the financial implications of the management of ALG be recognised, that management programs continue to be supported by public monies and that less financially reliant management practices be seriously examined. This includes grazing and the reduction and/or stopping the use of herbicides where feasible, with positive environmental outcomes in mind. vi)preparing a report on agreements to be presented to the ACT government. The stakeholders in the MRC have different visions for the study area. Environmental and rural interests are to the fore, and it appears that the overall urban community may have little interest in the management of ALG in the MRC. This is probably true in the very short term, but the long term economic, social and environmental problems will have flow on effects throughout the community. It is therefore important to continue to expose the whole community to education on weeds and weed issues, as difficult as they are to get across. The roles for the educative process will almost certainly remain with agency and community organisations working in harmony and cooperation towards a stated goal, and clearly expressing this to the community at every opportunity. It would be greatly advantageous for a consensus on management being brought forward by a combined force of environmental and rural groupings, including urban Landcare related groups. The effectiveness of public education and awareness only becomes evident over a long term, and even then is only likely to have effect on those members or groups within the community who have an interest in the first place. This is quite the norm. Raising public awareness on weeds and weed issues is no different, though weeds are generally harder to sell than, for example, social issues such as the state of unemployment or the economy. It is however another weapon in any integrated weed management program, and must continue. The ACT Weeds Strategy released in 1996 has bipartisan political agreement and support, and was formulated as a result of extensive opportunities made available for community input. It is a 10 year strategy, during which time improvements to the weed situation in the ACT should be noticeable. Time is required for the Weed Priority program to take effect. However, positive effects will only be noted if current resources are maintained or increased (see “Economics of control” above). The support of all political parties for the ACT Weed Strategy is a very positive situation. Financial support has been increased in the recent past and this support is likely to be maintained by government(s) while ever there is broad community support for the Weed Strategy and its various management programs. It is even more likely to continue to be supported by government where often conflicting interests can reach agreed positions regarding management. This will require efforts on behalf of all stakeholders to come to agreed consensus on management, and to lobby all political factions from that united position. Section 7 - Actions to Date. As mentioned earlier, the most important single action taken to the present time is the acceptance by all stakeholders that ALG is an undesirable species which is affecting rural production and nature conservation values, and that the potential for continued and increasing degradation caused by AGL is high and it therefore must be contained. In recognition of this, Parks & Conservation Service staff and rural lessees have initiated practical (and successful) “on-ground” programs, and information and awareness sessions that have been well attended. The knowledge and information base already available within the agency and the rural lessees is comprehensive enough to make the more focussed and detailed decisions required for the management of ALG management within agricultural zones of the corridor. The effects of ALG within nature conservation zones are also well known. Conservation groups have often drawn attention to the invasive nature of AGL in the MRC and elsewhere. The eastern side of the study area between Point Hut and Pine Island is an area of some significance for its remnant vegetation. It has accommodated a herbicide trial area, as well as tree planting exercises related to shading out ALG. These have been carried out by the P&C Service with contributions from the local Parkcare group (the MRC South Parkcare Group). Despite this, the area carries the largest (basically unmanaged) and most dense infestations of ALG. The infestations have spread to the urban perimeter and transport routes, and are an area of prime concern. The conservation values of this site will be even further degraded unless some action is taken quickly. The ACT Weeds Working Group, Landcare Subcommittee and Environment Advisory Committee have all agreed to the acceptance of ALG as a weed for priority control. It would appear all approvals for the ongoing management of this species are now in place. Spring Station: where ALG management was undertaken on a whole farm basis. This program involved grazing management, utilising ALG and pasture improvement. The property was subdivided into several paddocks. One highly disturbed paddock was sown to a phalaris-based pasture. This failed due to red-legged earthmite infestations and reinvasion by ALG and Couch Grass Cynodon dactylon. Further funding has been provided to re-sow this pasture, taking into consideration adequate weed and earth mite control. The adjoining paddocks were fertilised with single superphosphate and rotationally grazed at high stocking densities (20-30 DSE/ha during the spring, summer and autumn months). These paddocks were largely native pasture consisting of Weeping Grass Microlaena stipoides, Wallaby Grass Danthonia spp. and Redgrass Bothriochloa macra. Reductions in ALG density have been from 30-40% cover to less than 10%. This program has been funded for a further three years. This will assess medium term results and economic viability. Castle Hill: where three separate trials were undertaken. The first involved treatment with Frenock® in late spring; Roundup® (Glyphosate) for total weed control in the following autumn and direct drilling of a Phalaris/Cocksfoot Dactylis glomerata pasture. The results have been a strong competitive pasture with very little re-infestation of ALG on the very shallow soils. The other trials were on deeper colluvium and alluvial soils. The first paddock was cultivated and fodder cropped prior to sowing an improved pasture. The second paddock was direct drilled without cultivation. Both trials failed due to poor seasonal conditions and inadequate weed control. Whilst fodder cropping and sowing of improved pastures is the recommended control technique this trial demonstrates the requirement for sound weed control prior to pasture establishment and attention to grazing management post pasture sowing. RECOMMENDATION 9: that further trials and demonstrations be established to assess best practice and recommendations for ALG control on arable soils on rural leases. Information and awareness sessions on the management of ALG for (and by) rural lessees have been conducted on a regular basis. Stuart Burge (an agricultural consultant) presented a comprehensive session on the utilisation of ALG by grazing in the summer of 1997-98. The techniques described by Mr. Burge offer considerable benefits for the management of ALG, and are used on at least some areas within the MRC. They offer further potential on other sites. ALG is a Category 2 weed on the ACT Weed Listing. A Category 2 listing is for weeds posing a serious threat to agriculture, the environment and community and having the potential to spread to other areas. New or isolated infestations must be fully and continuously suppressed to significantly reduce infestation and further spread (ACT Weed List 1998). It was agreed that ALG was to be placed in this Category even though it is already widespread, and that further onus for management would be placed on all land managers in the ACT. ALG has also been a target species on the ACT Priority Weed List for the last 2 years. Listing of ALG as a priority weed species in the ACT is part of community education and awareness-raising as required under the ACT Weed Strategy to control new and isolated infestations on the priority weed program. General community interest in ALG is currently very limited and always likely to remain so. It is also probably true to say that increasing community awareness specifically on the problems of ALG will be difficult if not impossible, if other experience is taken into account. However, the community’s broader understanding of the overall problems of degradation of riverine systems is much better developed. The major interest in ALG will remain with agencies, rural and environmental stakeholder groups, and continued information flows between these groups is critical. It is important that these groups are somehow involved in increasing our knowledge of ALG in the ACT. For this reason, it is important that valuable financial and human resources may be better directed toward on-ground work, and to focus further awareness of ALG within the broader context of campaigns focussed on riverine problems, rather than on ALG itself. vi)the agency take a lead role in keeping information channels between stakeholder groups operating. Since the decline of the original riverine vegetation, revegetation has occurred, whether by accidental or planned means. Many exotic species were introduced with European settlement, both for horticultural and agricultural use. Some were purposeful introductions, and others accidental, usually as contaminants with desired species. With time, landscapes have changed and, in the case of some species of introduced flora, is an important component of European cultural heritage in Australia. On the other hand, these species have become serious invaders that have added considerably to river and land management problems. The greater percentage of introduced species that have naturalised within the corridor are the result of naturalisation from planted sources rather than actual deliberate plantings. There is a strong case for the removal of all adventitious individuals as the problem is worsening. Willow and English Elm management has already been commenced. A major source of weed invasion is from the Village of Tharwa, and the residents should be the focus of a major campaign on horticultural weeds. Large scale revegetation has been used at Pine Island, where an extensive Monterey Pine (Pinus radiata) plantation has been established. This species also will provide an ongoing management issue within the MRC, as wildling pines can readily establish on even the harshest sites. More recently, organised revegetation activities to date have included the planting of some 50,000 trees on various stretches of the river bank (P&C Service 1997). Two notable efforts have been the planting of native vegetation on the eastern bank near Lanyon and among the moderate to high conservation value of the eastern shore between Point Hut and Pine Island. While the planting near Lanyon appears to be thriving, there have been mixed results at the Point Hut/Pine Island, with many deaths obvious. The latter planting appeared patchy, and if the intention was for shading of the ALG, further attention will be required to replace the dead plantings. It should be noted that wherever dense willows (Salix spp.) occurred, there was an absence of ALG. Dense trees of Silver Wattle (Acacia dealbata) had a similar effect. Conversely, there was also an absence of any native vegetation under willows. Removal of any dense vegetation will open new areas to ALG infestation, and this should be noted with regard to any proposed management regimes. A trial using various chemicals to manage ALG was conducted by the P&C Service with the assistance of the MRC South Parkcare Group. This trial was centred on a location where useful remnant native grassland species, particularly Kangaroo Grass Themeda australis syn. T. triandra occurred. The limited trial showed that the use of Frenock® at 2L/ha, delivered with 1000ml of water per 10sq.m. plot has a minimum effect on Kangaroo Grass but killed the ALG. No effect on other native grass species appear to have been taken into account, with the trial suggesting further work is required. The use of Glyphosate as a broadacre spray is not recommended as it leaves large areas free of any plant material thus enabling re-infestation by the same or other undesirable species. As ALG has invaded remnant vegetation in some sections of the corridor, especially on the section between Point Hut and Pine Island, further experimentation where chemicals can be used would be a useful exercise. There are a number of basic principles associated with any integrated weed management program that are vital to ensuring success. These principles are already widely known and available, but are important to revisit. Comments are provided on the constraints where they are relevant to this strategy. Correct identification can be a shortcoming of any weed management program. Unless the problem species can be identified and located for further action, then a management program could fail or be severely hindered. The various species and cultivars of ALG vary considerably, but fortunately the variety causing concern in the ACT is relatively easy to recognise. A greater effort to increase the recognition skills within the community may be of great assistance in locating new infestations. Another purpose of accurate identification is to enable some form of collation of infestations within the ACT (e.g. mapping) so the full extent of the problem can be understood, and suitable strategies for control put in place. This is a key crucial action for management and preventing the further spread of ALG. It is a practice that should be part of “every day” management. Actions to prevent spread vary from ensuring seed obtained for cropping or pastures is not contaminated, any vehicles and machinery do not carry seed to uninfested sites and revegetating cleared or disturbed sites. Decontamination of vehicles and machinery can be extremely effective, but is unlikely to be observed. While rural lessees and contractors are more likely to carry out such a procedure, it is highly inconvenient or impossible in some locations. This is why prevention is more often related to early intervention which is discussed below. As an aside from the MRC infestation, the continued importation of topsoil into the ACT from known infested locations is ludicrous in the extreme. ALG is continually being imported and is costing the community for management programs, often using highly toxic chemicals. This action is not environmentally or economically sensible, let alone sustainable. There is no point in managing the MRC if ALG is being imported and spreading everywhere else. Early intervention is a highly efficient means of managing weed problems. It relies on getting onto new outbreaks quickly and taking every feasible step to eliminate the population. This is particularly relevant to locations just outside the immediate MRC e.g. roads entering and exiting the MRC, grazing lands away from the MRC and in other parts of the Territory. Successful early intervention will rely heavily on community participation, not only in locating and advising the P&C Service of the infestations but wherever feasible in carrying out the eradication program. 8.4) Physically removing or spot spraying small infestations and individual plants. This method has proved to be extremely cost effective, as well as an environmentally sound procedure. It has been used by some rural lessees in the catchment over a long period. These properties are basically free of ALG (D. Busby & D. Boorman pers. comm.). It is also resource effective, utilising available labour and minimum herbicide. The method is useful only in light or new infestations, and is conducted while on regular property monitoring trips. Ploughing and the sowing of introduced pastures can be a viable alternative on suitable country and soil types (see section 7.1). In large and extremely dense infestations some form of wholesale overhead spraying may be warranted. This can only occur within the regulatory guidelines set for chemical usage, and in locations where usage of the chemical concerned is permitted. It should only be applied when a “softer” technique is unavailable, and there are no other immediate environmental implications. It should on no account be considered in areas reserved for environmental protection or other sensitive lands. Aerial spraying of herbicide is not recommended. As the initial knockdown effect is over extensive areas, monitoring needs to be diligent over the whole area and subsequent regerminations controlled. Extensive clearance of the ground opens up the site for re-infestation by AGL or other undesirable species. Pasture re-establishment may be difficult on such sites. If complete removal of large weed infestations is decided, it must be done with an objective or vision of what is desired in their place. Whether the replacement is by native vegetation, boosting native pasture or introduced pasture will depend greatly upon the desirable landuse and land capability of the site. In any case of weed removal, vegetation must be replaced and the site monitored as regeneration occurs. In areas suited to introduced pastures, two annual fodder crops before sowing introduced pasture is highly efficient in depleting the soil borne seed store of ALG. With native vegetation, maintaining the density of native pastures increases competition and shade factors provided by dense native tree and shrub vegetation assists in keeping infestations low. All the above is also consequent on ensuring other pest species, plant or animal, are also being managed. Rabbits, hares and kangaroos need to be limited in access to regenerating areas. Other weed species common in the locality ( e.g. Purple Top Verbena bonariensis, Briar Rose Rosa rubiginosa, St John’s Wort Hypericum perforatum, Blackberry Rubus fruticosa complex, Skeleton Weed Chondrilla juncea, Vipers Bugloss Echium vulgare, Hedge Mustard Sisymbrium officinale., Serrated Tussock Nassella trichotoma, Willows Salix spp. and English Elms Ulmus procera, Privet Ligustrum spp. and Fennel Foeniculum vulgare) must also be managed and controlled. the use of machinery for “maintaining” roadside verges (slashing, mowing). the absence of other management factors such as grazing, which has a tendency to inhibit establishment when used in a methodical way (but obviously not a feasible proposition on all roadsides due to other values and the quantity of traffic). passing vehicles carrying the seed on tyres or undercarriage which is deposited elsewhere. The significance of “protected roadside vegetation” signs in regard to protection of high quality remnant vegetation from certain weed management activities should not be ignored. The current program of installation of signs indicating significant remnant roadside vegetation should be applied as a priority on roads traversing the MRC. Pine Island, Point Hut, Tharwa Recreation area, Tharwa sand wash area and tourist venues such as “Cuppacumbalong” have high infestations. Besides traffic entering and leaving these zones, pedestrian traffic may also be responsible for moving ALG. It was noticeable at a number of locations along walking tracks (especially on the eastern side of the MRC between Point Hut and Pine Island that ALG was establishing in zones otherwise relatively free of ALG. Some significant remnant native vegetation still exists in the study area (see vegetation map). These areas may require more specific techniques for management, as many of them verge on the river itself, and the high conservation areas are often isolated from each other over the broader site (e.g. the eastern corridor from Point Hut to Pine Island). Without immediate strategic actions, these sites will continue to degrade. In some sites, revegetation/regeneration activities may be the best options to employ. These are the sites that environmental groups wish to see maintained and enhanced, and their opinions as to how the management is to be conducted is vital to both long term success and their continued support. ALG has established some distance away from the MRC on roadsides and at higher levels within sub catchments. It is of crucial importance that some efforts be made to start eliminating infestations at higher elevations, gradually working down the sub catchment toward the MRC. Higher infestations will only act as sources of reinvasion for lower sites as seed is washed down in storm events (e.g. Serrated Tussock infestations near Sydney originating at Crookwell, MRC ALG infestation emanating from the Monaro district). It is important for all rural lessees and other land managers to cooperate in this effort as some sub catchments cross property boundaries. The priorities for rural lessees should be to manage much as they have been doing on their own land, but to place a greater emphasis on new infestations as they occur, and to work in cooperation with the agency on roadsides and public lands that adjoin their holdings. This will include any modifications to grazing regimes on public land as agreed by the agency, community and lessees at the proposed workshop/information forum. At all times great care should be taken to protect native vegetation on all lands where it occurs, but especially on public lands. the composition of the existing vegetation community (especially with regard to those species that may proliferate and infest areas where ALG has been removed). This also includes examination of the indigenous flora existing as remnants and/or which offer potential for regeneration on sites after ALG removal. hydrology which is important with regard to the movement of the species along flowlines where only certain herbicide treatments can be used. Complete removal of any vegetation can also affect other factors like bank stability. that the availability of light is crucial for the successful recruitment and growth of ALG. Reducing access to high light levels can diminish the intensity of an infestation, and if enough light is reduced, ALG does not survive germination or young growth stages. the fire regime, whether through accidental, malicious or prescribed use of fire. base starting points in which to tackle the problem. Not all the following management proposals will be satisfactory to stakeholders. For example, many in the community, including the author, have been vocal environmental proponents of removing grazing from ephemeral or permanent watercourses where at all feasible. There are not many situations where the removal of grazing is not feasible, but the study area of the MRC is one of these sites, at least until improved, safer and more environmentally sound forms of control are available. Therefore the proposal to retain grazing in some areas, and reintroduce managed intermittent grazing in other locations will rightly be of concern to some parties. In anticipation of this concern, the preparation of this strategy has carefully considered the broader implications for the natural environment if ALG is not adequately managed. The consideration was not only related to the invasive nature of ALG in natural areas, but also to the use of the herbicides currently used in management. Frenock® is the most effective chemical for ALG control at present, partly because of its residual properties. It is not a chemical that any land manager likes to use, and certainly does not gain much, if any, support from the environmental movement. The P&C Service have achieved some excellent results by using Frenock® at lower than recommended rates (2L/ha). A permit has been issued to allow use of this herbicide at this reduced rate. Other initial trials have shown promising results with the use of Frenock® at 0.5l/ha, and further trials should be conducted using various application rates of this herbicide. The P&C Service have also conducted trials using Glyphosate, which has distinct advantages when used at particular growth stages and it currently regarded as a safer chemical to use. Even so, management programs should curtail the use of any chemicals where it possible to so. The future availability of Frenock® is in some doubt anyway (see “Herbicides” below). In order to protect a range of environmental values, and provided satisfactory arrangements are in place to protect known items of concern (e.g. Anchor Plant Discaria pubescens – a vulnerable species; grassland sites; conservation quality riverine vegetation as well as trees of heritage significance) and focussed management arrangements are put in place, there appears to be no legitimate reason why grazing should not continue to be used on some sites within the study area, and re-introduced to a few others. Some current operations will have to be modified. The various actions listed below should be used in conjunction with each other to achieve management. Comments are provided on each technique. The study area is only one small part of the infestations of ALG within the ACT. Other large infestations are known to agency staff, but isolated outbreaks are becoming more frequent. There is little point in placing a strong emphasis and considerable numbers of dollars toward the management of ALG in the study area if other outbreaks are permitted to establish. One of the initial management actions must be to grasp some idea of the full extent of the problem. This can only be achieved by locating infestations through a mapping exercise. While mapping over a wider area is required, it is outside the scope of this strategy. The same principles apply however, on a more localised scale. Field work for this strategy only looked at the immediate river fringes, and in some locations ALG has established on rural leases and roadsides well away from the immediate study area. Infestations are severe in some localities, and are probably a daunting proposition for land managers to tackle. Working together to accurately map these locations may assist neighbours in formulating plans to manage the problem. With regard to a wider mapping proposal, there appears to be a fairly comprehensive knowledge from within the community and agencies of the locations of ALG infestations. If encouraged in the right way, community groups may well be able to assist in gathering more information on infestations throughout the Territory. c)that a Territory wide survey for ALG infestations is warranted, and an effective means of achieving this would be by encouraging community groups to become involved. Mapping should be a priority item for discussion at the workshop/information forum proposed in Recommendation 1.
d)that the wider infestations of ALG on the periphery of the corridor be accurately mapped by rural lessees with their immediate neighbours where this information is not currently available, or priority management actions are required. Complete quarantine (isolation of infestations) is a very effective technique for weed management, especially with an aggressive species such as ALG. However the ability to quarantine the MRC is totally unfeasible. Public access to many essential tourist facilities and recreation areas and even local travel rules out isolation as a quarantine measure. As a second level of quarantine measures, partial isolation such as not using vehicles within infested areas, washing down machinery and tools after contact with ALG areas and limiting access to particular areas are also effective. While they can be effective, motivation diminishes very quickly due to the cost and time factors involved. Vehicles also have to be moved to wash-down points or another vehicle travels to them. Either way, costs and time are usually a more considered factor that the efficiency of the methods themselves in saving future costs and time. Expectations of vehicle wash-down and limiting access in any form being undertaken is unlikely unless managed within an individual property. If seed is imported (e.g. fodder crops or improved pastures) for any reason it should be certified seed to ensure quality and lack of contaminant species. Quarantine is a limited method with which to manage ALG in this instance. Grazing has been a primary landuse along the Murrumbidgee River since the earliest days of European settlement in the district. The length of time the area has been grazed is reflected in the many historic properties in the portion of the MRC under examination (e.g. Lanyon, Lambrigg, and Cuppacumbalong). The MRC has been dramatically changed under these agricultural regimes, with ALG being a part of that change, albeit a relatively recent one that has infested the area from grazing areas further upstream. The emergence of ALG raised some concern, and has caused some contention in the past between rural lessees and the Parks & Conservation Service, but there now appears to be a general recognition that the problem is here, probably to stay, and that the community now has to live with the situation. It is important to note that grazing regimes appear to be managing ALG on some properties within the MRC, with ALG being present only in scattered tussocks. to stock shortly before the flowering scapes open in spring. This is highly advantageous, because grazing at this time can reduce the number of seed heads that mature, though the plants will initiate new flowering scapes and attempt to flower again after grazing is withdrawn. Where grazing is used as a management tool, the objective must be to maximise green leaf production, and this may mean regular heavy rotational or continuous grazing during the growing season. Under this type of management, at rates in excess of 20 dse/ha over the summer months, stock has gained weight and/or maintained condition and the ALG prevented from spreading. Continuous hard grazing gradually wears the ALG plants down, causing them to burn all reserves in the production of new foliage. It can actually kill ALG plants. The best part of a grazing regime is that it substantially reduces the need for herbicides over wide areas, usually a significant cost in both real terms and on the environment. Additionally, the use of sub clover and increasing soil fertility (fertilizing) has been effective. Introduced pasture species and fertilizing are not necessarily appropriate in good quality native pastures. Where grazing ALG is used as a management tool, there may be a requirement to provide stock watering and artificial feeding points off river, so stock are able to utilise the ALG more efficiently. Grazing also has potential for the management of other weed species such as Serrated Tussock and Chilean Needle Grass. The proposed re-introduction of grazing will not necessarily be detrimental. The MRC is a very disturbed landscape, containing many introduced species with high invasive potential. If ALG is not managed, it will continue invading less disturbed sites and affect the natural values of the remnant native vegetation that remains. There are probably limited benefits to rural lessees in direct production off ALG, but benefits to the whole community (including lessees) in reducing the source of infestation or at least slowing the progress of ALG. There are areas where the re-introduction of stock is not desirable, and these sites are indicated on the map and dealt with under “Revegetation” below. contracting rural lessees to undertake grazing of sites rather than moving towards leasing and/or agisting these sites. Contracts would mean the proponent retains greater management control over the river margins of the MRC. When suggesting the use of grazing, it is recognised that roaming domestic dogs can be a constraint in utilising stock in close proximity to urban areas. This matter is outside the scope of this strategy. Fertilizer applications can be utilised in the management of ALG in two primary ways. The first method is to fertilise with a nitrogenous based fertiliser applied to infestations of ALG in the early spring. Nitrogen fertilisers will boost the vegetative growth of the ALG, making it more palatable to stock. By application in the early spring, allowing growth to establish and then introducing stock at the right time, the ALG will be eaten down. If correctly timed, this method also interferes with and reduces the flowering and seed setting capacity of the species. As with many grass species, if stock is taken off the site the ALG will, if growing conditions are still conducive, attempt to flower a second time. This may require a second intensive grazing regime to disrupt the second flowering cycle. The second means of utilising fertiliser is to stimulate other species, either as a means of increasing the palatability of the ALG, or providing intense competition so that ALG cannot easily establish on new sites. If a component of legumes can be maintained within infestations by providing the correct phosphorus and sulphur ratios, they will fix atmospheric nitrogen which will assist in naturally boosting the ALG, the same effect as applying nitrogenous fertiliser. Well maintained swards of introduced pasture, which require feeding to reach maximum potential, can act as a very effective inhibitor for ALG seedlings, which are weak at the early stages and more likely to succumb with competition from other species. The use of fertiliser can therefore provide distinct advantages in the management of ALG. The fertiliser regime for any particular site would have to be established by individual land managers. The cost of fertiliser application needs to be considered, however, the benefits of fertiliser applications in the management of ALG and introduced pastures are cost efficient over the longer term. A note of caution with the use of fertilisers is warranted. Most of the worst infestations of ALG are situated in close proximity to the river. The effect of fertiliser on water quality is well established, so any fertilizer regimes must be carefully planned and applied so usage by vegetation is complete, and runoff into the river does not occur. The use of chemical herbicides in association with agricultural production, within areas reserved for nature conservation or areas that may be subject to adverse environment impacts from chemicals (e.g. the river itself) is not desirable. Australia has previously suffered because of environmental and stock contamination associated with the use of chemicals, and it is of the utmost importance that the use of chemicals be considered as a last resort, or only used where there is no other reasonable and practical alternative. Not only is environmental contamination an issue, but the associated dangers of regular chemical usage for spray operators must be considered. While the use of chemicals should be avoided where at all possible to do so, it is not possible in many situations where ALG is found. Chemical sprays, at least for purposes of initial knockdown of the ALG, are the only realistic scenario. Two chemicals are currently used for the management of ALG within the MRC, these being Fluproponate and Glyphosate. Frenock® (Fluproponate) has proven to be the most effective chemical for the management of ALG, providing long term residual control. It is used primarily as an agricultural chemical for the control of Serrated Tussock, ALG and Parramatta Grass in Australia. It is regarded as a Schedule 6 poison, and Frenock® is a translocated herbicide which can take considerable time to take effect. A fact sheet on Frenock® (TEC 1998) is attached as Appendix 1. Frenock® cannot be used in situations where it may leach into a watercourse or underground water. This applies to the highly porous soils adjacent to the Murrumbidgee River. Frenock® resides in the soil after application (residual) and breaks down only slowly under anaerobic conditions (TEC 1998). As mentioned earlier, a considerable amount of work has been done by the P&C on using lower rates of Frenock®, which have been very successful. Further experimentation is required and if shown to work, the lower rates should be utilised at all times. However, the future availability of Frenock® is in great doubt, and alternatives may need to be sought. This chemical has shown variable results. Spot spraying at 1:100 in late spring under good growth conditions has been satisfactory. Broadacre treatment has produced mixed results even at rates of 3-4l/ha and is not recommended as it is a translocated herbicide which has toxic effects on most plant species. Broadacre spraying therefore leaves an open seed bed ready for new infestations. Glyphosate is sold as Roundup®, Accord®, Vision® and Rodeo® (Greenpeace 1998). An information sheet (Greenpeace 1998) is attached as Appendix 2. The indigenous vegetation and general morphology of the MRC has been radically changed from its original form. Within the river reduced flows and irregular flood events, sedimentation, deteriorated water quality and exotic fish species have modified the river, while on the banks and floodplains significant destruction of riverine vegetation and the introduction of weeds and feral animals have assisted in the decline. However some remnants remain, enough to give a reasonable picture of what the original landscapes were like. These remnants should be retained (see attached Map 2) and managed for their natural values. With the MRC being an important migratory route, some of these sites (excluding sites with grassland and shrubland values) also offer scope for replanting to increase the natural values, especially with regard to the provision of habitat. Revegetation activities should concentrate in areas of highest natural values and move out from these locations. Other sites along the banks have been disturbed, have significant potential to erode and permit only limited access by stock. These sites are highly suited for revegetation activities, thus boosting the values as a wildlife movement corridor and simulating the original landscapes of the MRC. These areas are also marked on attached Map 2. By increasing the plantings on these sites it may be possible to substantially reduce the infestations of ALG. The poor tolerance of ALG to low light conditions was confirmed by the survey. ALG was severely reduced in occurrence under the deep shade cast by both Casuarina cunninghamiana (River She-oak) and Acacia dealbata (Silver Wattle). Under large casuarinas, it was difficult to locate any ALG plants. It therefore stands to reason that wherever revegetation is used for management purposes, the plantings should be thick to provide as much cover (shade) in the shortest possible time. Other stands of native vegetation containing Kunzea ericoides (Burgan) and Callistemon sieberi (River Bottlebrush) close to the river do not prevent the establishment of ALG except where very dense in nature. In almost all locations where these species occur ALG was also found. The lower stature and open nature of these latter species permits considerable quantities of light to penetrate to the ground surface. Revegetation may also be a realistic possibility for the extensive stretches of disturbed roadsides emanating from the MRC, thus increasing the habitat values of these areas. Plantings of shrubs and trees should not be conducted over remnant grasslands which are found along some portions of roadsides. Cultural landscapes are also a consideration within the corridor. It may not be desirable to revegetate in some locations for cultural landscape reasons. The use of prescribed fire can be of assistance in weed management. The use of fire in the management of ALG can best be utilised for the removal of thatch and promoting growth in existing tussocks and to stimulate the germination of soil-borne seed (see section 7.1). ALG is a species that has evolved with fire, and recovers strongly after fire events. The strong growth stimulated by fire is more palatable to stock, and makes Glyphosate based chemicals a more feasible alternative. Stimulating germination of seedlings prior to intense stocking also ensures there are lower recruitment percentages. However, the use of fire is often limited for other reasons. It may well have application to sites where limited areas are to be treated or used in areas where the chance of escape is minimal. There are some heavily infested low-lying areas close to the river where the initial application of fire may be of assistance in Intensive grazing management. Much energy and effort is currently being placed into the PMA process with rural lessees. While PMA’s have caused concern amongst many rural lessees, they can be a very useful tool for weed management purposes. This is not by imposing stipulations and onus solely on the lessees, but by both parties formally agreeing to cooperative actions to manage certain weed species. It is a sensible and logical place in which to agree to any grazing regimes to be used in the MRC. It is stressed that there must be some degree of flexibility in agreements when grazing as a management tool is undertaken. Apparently grazing has previously been permitted in certain parts of the corridor by agreement with the P&C Service, but the conditions have sometimes been very difficult if not impossible to meet by lessees. At the same time, the P&C Service have to meet their business objectives and the expectations of the broader community with regards to environmental protection. The very apparent goodwill that currently exists between officers within the agency and the rural lessees would appear to be sufficient to enable satisfactory arrangements to be made about suitable grazing regimes. Individual grazing regimes will differ from area to area, especially with regard to the density of infestation, so cannot be specified here. They will certainly be a source of discussion at the proposed workshop/information forum. less need for reliance on other more expensive forms of management. Funding for purely weed control activities have been notoriously difficult, if not impossible, to obtain under many funding sources, especially through those associated with the Natural Heritage Trust (NHT). However, sources of potential funding are well established and assistance with regard to likely funding sources should be examined by Landcare coordinators based with the agency. The proposal for the ACT based Rural Conservation Trust is an obvious source which is to be established for exactly this sort of purpose. Fencing of a permanent or temporary nature will be an integral part of protection of areas of remnant native vegetation and the Fencing Incentives Scheme operated under the auspices of Greening Australia are a likely source for funding. The ACT Community Environment Grants process is also available. Some form of contractual arrangements between the ACT Government and rural lessees for the management of ALG may also diminish the need to seek funding from other sources. Other forms of sponsorship are not seen as a realistic source for this project. The consultation for this strategy revealed that many agency staff, rural lessees and conservationists were familiar with the various potential means of controlling ALG in the MRC. It would appear that some delays in taking action on ALG in the past may have been because of perceived fundamental differences between the agricultural and conservation landuses recognised in the MRC. This has been accentuated because of the public demand for review of many aspects of water (quantity, quality, environmental flows) and the ongoing protection of the values of rivers and riverine corridors through community activities such as Landcare, Parkcare, Waterwatch etc. While there are some fundamental differences which will need attention due to certain proposals in this strategy, they do not appear to be irresolvable. With the various values of the MRC being treasured by the ACT community, a “whole of community” understanding has to be reached about the management of ALG. This can only be done by the various interest groups being provided with an opportunity to meet together and work through the process (see Recommendation 1). The proposal for such a workshop/information forum should be seen as coming from a community/agency invitation. The essential parties to attend are the Lanyon Bowl Landcare Group, Rural Lessees Association, Conservation Council of the SE Region & Canberra, Canberra Urban Parks & Places, Environment ACT, ACT Forests, MRC South Landcare Group, National Parks Association, Paddy’s River Landcare, ACT Bushwalkers, Upper Murrumbidgee Catchment Coordination Committee, Greening Australia and Yarrowlumla Shire Council.. A general invitation should also be given to other Landcare related groups in the Territory. The only sure way to gauge whether inroads are being made with the control of ALG in the MRC (and the local region) is to adequately monitor progress. In the first instance it is crucial to know the actual extent of the problem, hence the suggestion for mapping (see 10.1 above). Photo points set up in representative examples of infested areas would also be beneficial. The photo points should be utilised on a quarterly basis as they will provide visual evidence over a period of time to record levels of infestation. Adequate records should be kept of the grazing regimes, and any other techniques utilised in conjunction with grazing to manage ALG. Agency staff should be an important part of any monitoring that is conducted. The strategy should be reviewed on a biennial basis, with a partial review after the first 12 months of operation. Discuss recommendation of grazing as a management technique, particularly in relation to areas proposed for grazing activities. Consensus or majority agreement reached and reasons for the decision relayed to all Members of the Legislative Assembly. Discussion on financial aspects, including funding sources and economies and effective alternative techniques for management of ALG. Most cost effective and efficient techniques agreed to by consensus or majority agreement and relayed to ACT Government. Monitoring arrangements agreed to and implemented. Agree on priority areas for control. Priority areas agreed and actions implemented. Rotational grazing regimes to be established. Formal agreements on rotational grazing regimes established and implemented. Current levels of extensions work by Agency maintained. Agreement by Agency that status quo will continue. Campaigns continue as opportunities are presented. Further experimentation and trial work on management of ALG, especially in areas of high to moderate conservation values. Agency, rural lessees, community groups. Further experimentation work implemented and results relayed to stakeholder groups. Program(s) to increase ALG identification skills within the community continue. Identification programs continue as opportunities arise. Johnston (no date); Making the most of naturalised Lovegrass, W. H. Johnston, Soil Conservation Service of NSW. MCMC 1998; Murrumbidgee Catchment Action Plan, Murrumbidgee Catchment Management Committee. P&C Service 1997; Point Hut Walking Trail Brochure, P&C Service. Lindenmayer, Bruce; Canberra Ornithologists Group, CCSERAC.